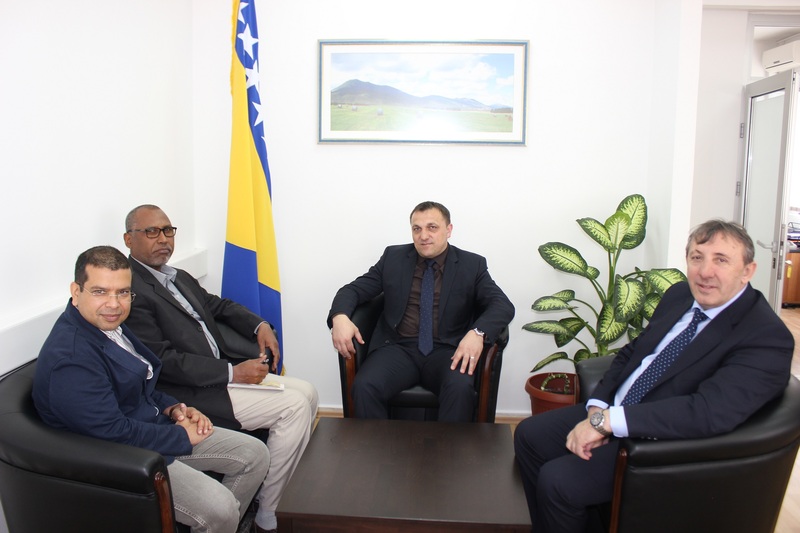 Minister Dedić, together with Mr. Halil Omanović, PCU director, met today with Mr. Mohamed Abdelgadir, IFAD Country Manager for BiH and Mr. Swandip Sinha, IFAD consultant for economic development, to discuss the potential scope of the new IFAD operation in Bosnia and Herzegovina. Minister Dedić expressed his appreciation for the continuing support IFAD extends to Bosnia and Herzegovina, stressing the positive effects of IFAD projects on agricultural producers across the country. IFAD representatives pointed out the importance of the two ongoing IFAD projects on rural business development and rural competitiveness, respectively, while focusing on scoping the new operation and determining potential target sectors in accordance with strategic priorities of the Government of Federation of BiH. “Our goal is to improve the structure of agricultural producers in the Federation of BiH and enhance the sustainability of our farms, focusing on such farmers who will see agriculture as their profession. For this reason, we want to encourage young people to take up agriculture and see farms as their places of work. I believe this is the target population that can greatly benefit from projects like these while contributing to the long-term sustainability of our farms,” said Minister Dedić in his conversation with the IFAD representatives. Minister Dedić also proposed the strengthening of the fruit and vegetable cooling and storage capacities and organic production development, which is one of the most promising sectors in agriculture and one with the best comparative advantages, as the main priorities for the eighth IFAD project. “Our agricultural producers can achieve high quality organic production and we will further seek opportunities to improve their status and ensure support for their hard work,” added Minister Dedić.